"Why Can't I Use Just An Ordinary Or Wooden Bathroom Mirror?" 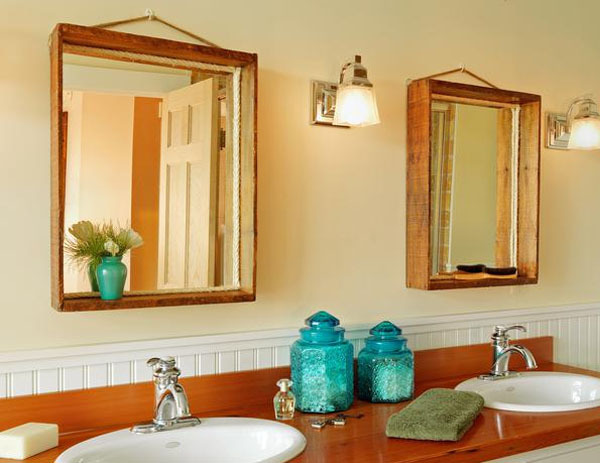 Moisture can be a real issue with wooden bathroom mirrors. It may be tempting to choose a wooden mirror for your bathroom, given their relatively cheap price. Many choose wood for their mirror frame believing it will provide a rustic, traditional or vintage feel for their bathroom renovation. While this may be true, the big problem you'll encounter with wooden bathroom mirrors is moisture. Regardless of how expensive or well-made a wooden mirror may be, it will still succumb to the damaging effects of the high moisture levels in your bathroom. Hot steam, splashing and a generally moist and damp atmosphere is the worst thing for wood. The wet environment of your bathroom will, over time, rot and wither any wooden mirror frame. Wet wood can crack, warp and wither over time, ruining the look of your whole bathroom. This is not to mention the bacteria that gathers in wet, untreated wood. 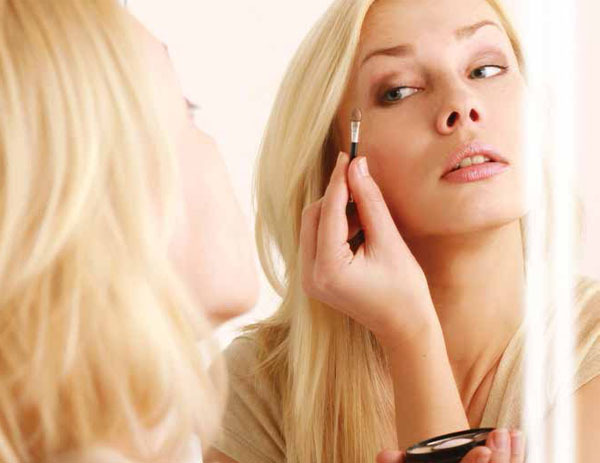 Many mirrors feature wooden backboards and supports which can also be damaged by moisture. This is why we insist on selling only metal, moisture resistant bathroom mirrors, to ensure your stunning new bathroom fittings will still be looking great in years to come. A good illuminated mirror can bring your bathroom to life, adding a warm glow. A real enhancement to any bathroom can be provided via LED Illumination, or indeed any kind of light on your mirror. These can dramatically transform a dark and dingy room into a welcoming and inviting bathing environment. A good illuminated mirror can bring your bathroom to light, adding a warm glow that will enhance the relaxing and luxurious aura of your bathroom. Highly popular for ensuites and smaller rooms, Illuminated or LED lit bathroom mirrors reduce gloom and can make a room feel larger and more expansive. 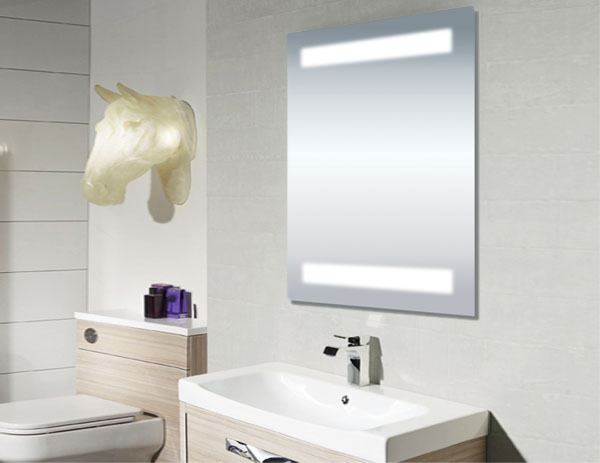 LED lit bathroom mirrors are the most popular, thanks to the brilliant light output the tiny LED bulbs produce. LED bulbs are dramatically more energy efficient than a standard bulb, helping to reduce electricity costs - as well as coating your bathroom in a soothing, flicker-free light. These mirrors are usually wired directly in to your mains supply, but can on occasion be provided battery operated. Many of the LED Illuminated mirrors we sell come complete with in-built demister pads, shaving sockets and clocks - more info on these features can be found below. Backlit mirrors offer many unique and eye-catching styles. Also highly popular are Backlit Bathroom Mirrors. These offer the same advantages as those listed above, but can be slightly cheaper depending on the size of the mirror in question. 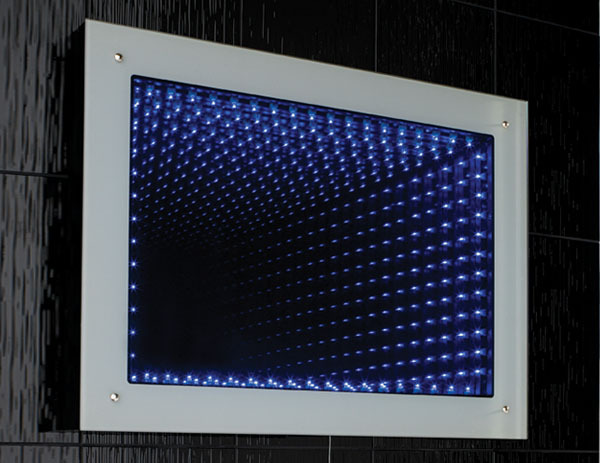 The difference between a Backlit and standard LED Illuminated mirror is where the bulbs / lighting source is situated. Backlit mirrors have their bulbs mounted towards the back of the mirror, with the light shining beautifully through carefully etched shapes in the glass. This is opposed to the mirrors above, which have their bulbs mounted on top of or within the mirror surface. Thanks to their backlit design, these mirrors can incorporate a wider range of lighting shapes than many other types of mirror, allowing new and unusual styles and designs which can truly make your bathroom stand out from the crowd. While often not quite as bright as the LED mirrors above, these provide a subtle and warming glow which would greatly benefit the feel of any bathroom. These mirrors are the perfect thing for your morning shave or checking your make-up. 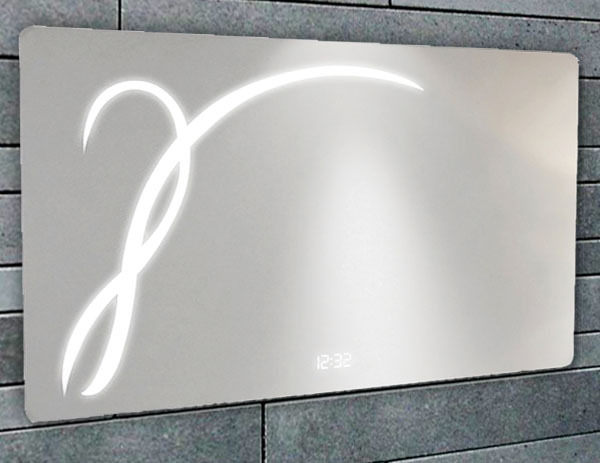 We currently have five eye-catching designs available in our Backlit Mirror range, as well as more information on the various designs available. Cabinet mirrors combine stylish looks with genuine practicality. In today's modern homes, space is increasingly at a premium - this is especially the case in many modern apartments and in guest or ensuite bathrooms. In situations like this, it is advisable to make the most of every inch of space you can. This is where a good Mirror Cabinet can make a real difference. Combining all the stylish looks and excellent design from the mirrors above, with a practical storage solution, a good cabinet can be an essential part of any bathroom. The Cabinet Mirrors in our range, for example, have a stylish and memorable mirror front, behind which lies a sturdy and well designed shelved storage unit. These are perfect for tidying away the many jars, bottles and other items that would otherwise clutter up your bathroom - all the while having these items easily within reach. The most popular mirrored cabinets are currently either in chrome / aluminium or white, as these are by far the most fashionable looks currently on the market. The advantages of this type of mirror are many, so it is easy to see why millions of homes throughout the UK have a mirrored cabinet in their bathroom. One of the most modern, state of the art and eye-catching mirror types available today, the Infinity Mirror is a brilliant way of making your bathroom stand out from the rest. Thanks to their unique and striking visual appearance, they create a superbly memorable and stylish centre piece for any bathroom. Installing one of these mirrors in your bathroom would make you the envy of your neighbours. Creating the effect of a never ending series of lights, a stunning visual experience is achieved via the angled placement of several LED lights. This makes for a great talking point and an impressive visual boost for the bathroom. There was a time when these kind of high tech additions were seen only in the fanciest, poshest locations - thanks to manufacturers like Hudson Reed however, these are now readily available to buy, and at a highly competitive price too. Many deluxe features, which were previously very expensive, are now available at great value prices. Thanks to modern advances in technology and manufacturing, the bathroom mirrors available today offer a wide range of superb additional features which would previously not have been available. Features like those listed above are provided as standard in many of the stylish mirrors in our range, and are bound to impress guests and neighbours. The safe and easy to use Infrared Sensor Switch enables the user to activate the lighting with a simple movement of the hand under the sensor, no need for an unsightly pull cord or finger marks on the mirror. A demister pad will ensure steamy bathroom mirrors are a thing of the past and leave your mirror fog free. The heated demister pad will heat the mirror to a few degrees above room temperature within 2-3mins, preventing the mirror from misting. The demisting effect will spread approximately 10-20% further than the pad itself. Another nice added feature included as standard is a crisp, clear LED clock which is displayed directly within the surface of the mirror. This subtle yet highly useful feature is a perfect addition to your morning routine, ensuring you're never late for work again. 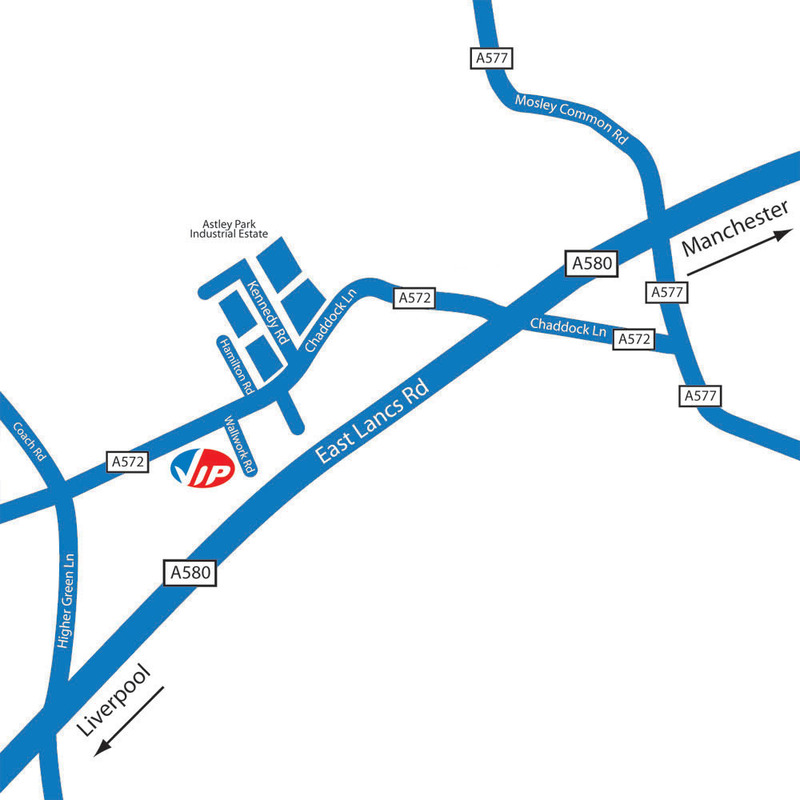 So there you have it - now you can make a choice armed with the information you need. The ever-expanding variety of mirrors available can be confusing and even daunting, but armed with information like that listed above, it is much easier to find the perfect new addition for your home.